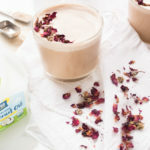 If you’re looking for a calming, stress reducing herbal remedy, try this rose tea latte.  I recently conducted a poll on Instagram and many of you expressed interest in learning more about the healing benefits of different medicinal plants and herbs. 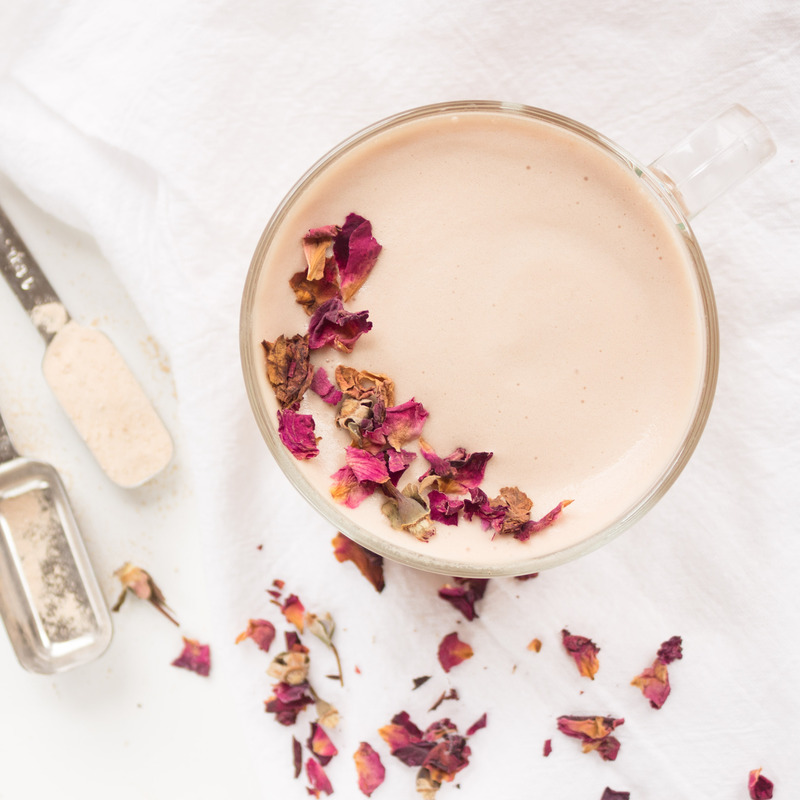 I’ve been incorporating more medicinal plants and herbs into my own healing journey while focusing on a diet balanced in protein, fiber and healthy fats so I’m excited to share more of these recipes with you, including this rose tea latte. Incorporating medicinal plants and herbs into your diet along with blood sugar stabilizing foods has numerous health benefits, including helping to manage stress, anxiety and mood. Blood sugar stabilizing foods include healthy fats, protein and fiber. These foods slow down the absorption of sugar into the bloodstream, helping to manage your appetite, digestion and blood sugar levels. Spikes in blood sugar can cause you to feel nervous, anxious, irritable and fatigued. Good sources of healthy fats include virgin coconut oil, MCT oil, extra virgin olive oil, nuts and seeds and avocados. Coconut oil is one of some of my favorite healthy fats for managing blood glucose levels while also improving the taste and quality of meals. 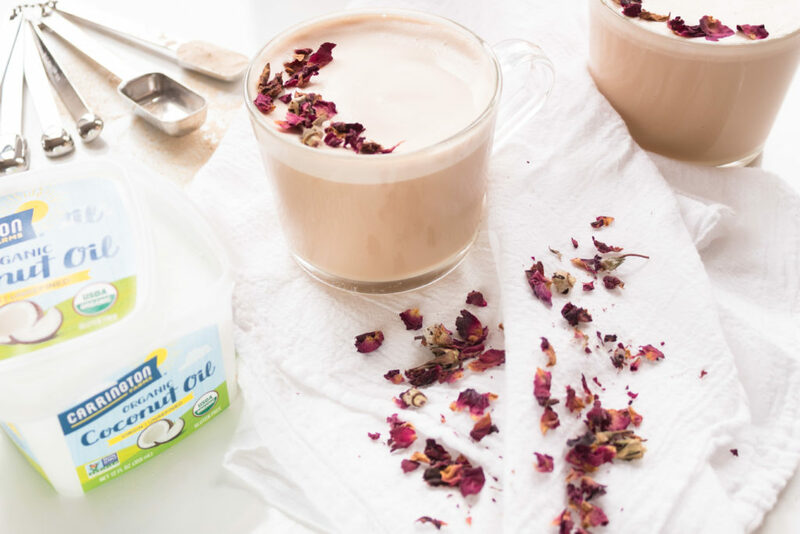 In this rose tea latte recipe, I use Carrington Farms Organic Virgin Coconut Oil. 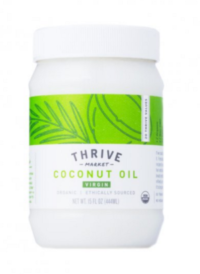 This coconut oil is simply pressed and packaged so it retains its original nutrient content, flavor and color. 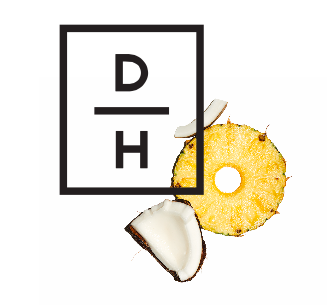 When coconut oil is refined, the baking and bleaching process reduces the number of polyphenols and medium-chain fatty acids available. These compounds are what offer the antioxidant and anti-inflammatory benefits of coconut oil. I always recommend choosing a virgin, unrefined organic oil if you’re cooking or baking at a temperature under 350 degrees. 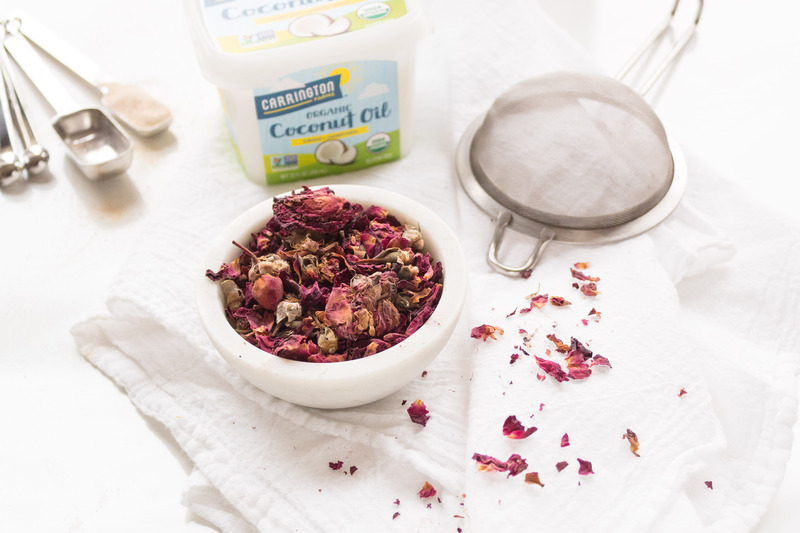 The other main healing ingredient in this tea is dried rose petals. Rose has many healing benefits including reducing stress and anxiety, menstrual pain and boosting your immune system. When working with different medicinal plants and herbs, it can no doubt be intimidating to get started but it’s actually relatively easy to make teas, such as this recipe. I always recommend using organic plants and herbs and finding a trusted source. Here in Boston I go to Cambridge Naturals or order online from Mountain Rose Herbs. Wondering how to get started or which plant or herb is right for you? In addition to working with your doctor and an herbalist or health coach, I recommend choosing a plant or herb you feel particularly drawn too and researching substantiated and credible ways to incorporate it into your diet. Of course I’m not recommending that you just go out and forage your own plants and herbs without educating yourself and working with a trained professional. Let’s be smart about things OK? Did you try this recipe? Let me know what you think in the comments below. For other healing recipes, click here. You'll have extra rose tea left over to enjoy. Place in an air tight container and store in the refrigerator. Thank you Carrington Farms for sponsoring this post and thank you for supporting the brands that make www.KerriAxelrod.com possible. The information on this website is not intended to replace a one-on-one relationship with a qualified health care professional and is not intended as medical advice. NO information on this site should be used to diagnose, treat, prevent or cure any disease or condition.